Some kind comments about World Clock and NaNoGenMo in the article “The Strange World of Computer-Generated Novels” by Josh Dzieza. 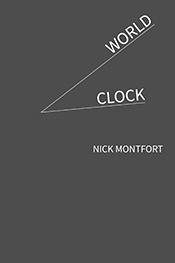 Nick Montfort’s World Clock was the breakout hit of last year. A poet and professor of digital media at MIT, Montfort used 165 lines of Python code to arrange a new sequence of characters, locations, and actions for each minute in a day. He gave readings, and the book was later printed by the Harvard Book Store’s press. Still, Kazemi says reading an entire generated novel is more a feat of endurance than a testament to the quality of the story, which tends to be choppy, flat, or incoherent by the standards of human writing. “Even Nick expects you to maybe read a chapter of it or flip to a random page,” Kazemi says. There were many great generated novels last year, and are already many great ones this year. I don’t think among this abundance that World Clock is a very good poster boy for NaNoGenMo. Still, my experience with the book does make a strong case for having your generated novel translated in (or originally written in) Polish. Update Jan 31, 2015: Review of Zegar światowy in PROwincja. Update Jan 31, 2015: Review of Zegar światowy in Lubimyczytać.pl. 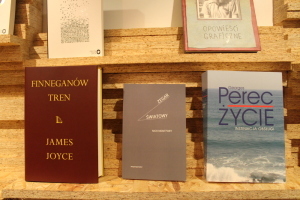 Update Jan 19, 2015: Review of Zegar światowy in Kulturnatywnie.pl. Update Jan 8, 2015: Review of Zegar światowy in kanapa.it. Update Dec 15, 2014: Review of Zegar światowy in sztukater.pl. 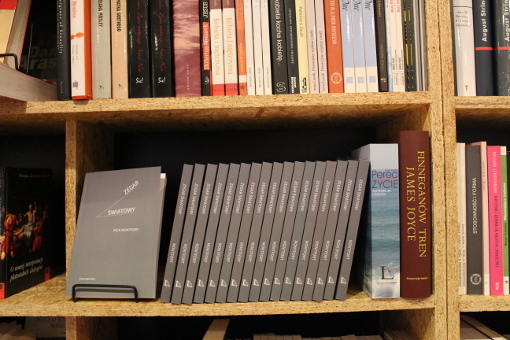 Update Dec 15, 2014: Review of Zegar światowy in sZAFa – kwartalnik literacko-artystyczny. Update Dec 10, 2014: Review of Zegar światowy in Popmoderna. Update Nov 13, 2014: Review of Zegar światowy in Stacja Książka. Update Nov 4, 2014: Review of Zegar światowy in Altmundi. Update Oct 31, 2014: Review of Zegar światowy in Gazeta Wyborcza. Update Oct 30, 2014: Review of Zegar światowy in kulturalnie.waw.pl. Review of Zegar światowy in Portal (nie całkiem) Kulturalny. Review of Zegar światowy in SZORTAL. Review of Zegar światowy by Katarzyna Krzan. Review of Zegar światowy in Pad Portal. Review of Zegar światowy by Julia Poczynok. There was also a review of Zegar światowy in the major Polish weekly magazine Przegląd (the review is not online). The book was also discussed in an interview I did on Radio Kraków. Here’s an interview of mine, in Polish and posted on the site interia.pl. World Clock is among the topics. Yes, Post Position will be switching over to all-Polish programming soon. But in the meantime we’ll have a few more posts in English. I announced the Polish translation of World Clock recently; here is, as far as I know, the first review of it – which is also the first review of World Clock in any language. It will appear in the magazine Fragile. Nick Montfort, Zegar światowy, tłum. Z jęz. ang. przełożył Piotr Marecki, Kraków, Korporacja Ha!art, 2014. Ciekawie przedstawiono w książce autentyczne przemówienie, w którym narrator mówi głosami innych osób. Autor nie tylko opowiada zdarzenie, ale pisząc, że tak było zwraca też uwagę na to, jak do tego doszło: „Ashgabat. Jest prawie 05:04. W pewnym przytulnym schronieniu sporej postury mężczyzna, o imieniu Jakub, czyta kanarkową umowę. Siada prosto”. Kategorii narratora szybko zmienia „punkt widzenia”. Forma książki to proza ​​poetycka z elementami pamiętnika, po prostu chronologia uczucia. Za to motyw napisania tekstu przypomina „travelogue”, ponieważ zawiera krótkie notatki z podróży. W składni poetyckiej odgrywa ważną rolę elipsa (opuszczanie słów, a nawet całych zdań) : „Samara. Jest około 12:39. W pewnym miłym miejscu zamieszkania średniej postury mężczyzna, nazywany Liang, czyta nieskazitelnie czystą kartkę. Całkowicie się wyłącza”. Ograniczenia krótkimi wyrażeniami wymuszają na czytelniku wymyślanie sytuacji, to jest oryginalną interakcję między autorem a czytelnikiem. W ten sposób autor zaprasza do dialogu. Struktura tekstu to mozaika, czytanie jest „rozdrobnione”. Możesz czytać książkę zarówno klasycznie, od początku do końca, jak też chaotycznie, otwierając ją na dowolnej stronie, co jednak nie powoduje uszkodzenia jej koncepcji. Styl pisania jest podobny do „nowego dziennikarstwa” (Tom Wulf, USA). Zmiana perspektywy (tzw. „kameleon”) to jedna z najbardziej interesujących i sprytnych technik. W ten sposób za pośrednictwem narratora autor gra z czytelnikiem. W związku z tym ważne jest również, aby pamiętać o zmienianiu „punktu widzenia”, o patrzeniu z cudzej perspektywy i opisywaniu wydarzeń postrzeganych przez różne osoby. Postaci to w Asmari, to w Tunisi. Postaciami są raz kobiety, raz mężczyźni. Zmiana płci i zmiana miejsca to ciekawe elementy gry autora. Ważne jest, aby zrozumieć, że podstawową zasadą dziennikarstwa jest prawdą, a Nick Montfort ignoruje wszelkie zasady i dlatego jest inny. umowę. Drapie się w ucho. World Clock (book, code) has now been published in Polish. The translation is by Piotr Marecki, who translated the underlying novel-generating program and generated a new novel in Polish. ha!art is the publisher, and the book appears in the Liberatura series, which also includes some very distinguished titles: The Polish translations of Finnegans Wake and of Perec’s Life A User’s Manual, for instance. I’m reading at the Harvard Book Store on September 18 – a week from now, on Thursday. The reading is at 7pm. I’ll be presenting and reading from my latest book, #! (pronounced “shebang”), which is a book of programs and poems, published by Counterpath Press in Denver. I’ll also discuss my previous two books, one of which is World Clock. I developed this for National Novel Generation Month last November; it’s a computer-generated novel. Cleverly enough, it’s been translated into Polish via translation of the underlying program. 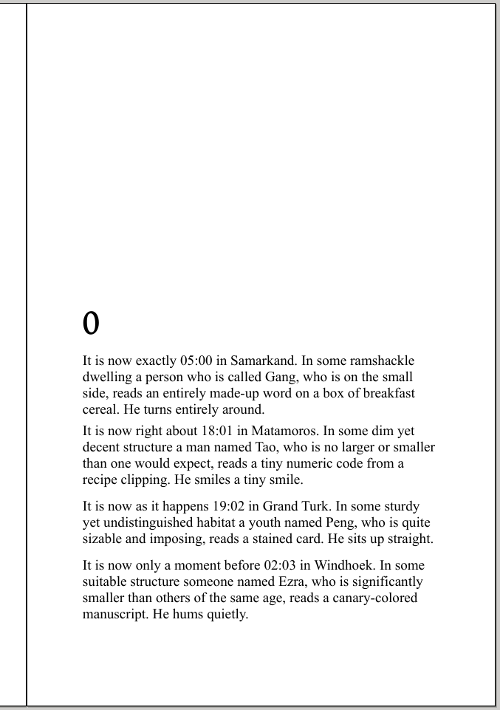 The other recent book is 10 PRINT CHR$(205.5+RND(1)); : GOTO 10, which I organized and wrote with nine others. This one, an MIT Press book, is just out in paperback. This is a critical, scholarly study of a one-line program, and although it is an academic book of this sort, it of course has a strong relationship to the code-generated World Clock and the programs-and-poems #!. The programs behind #!, by the way, are all available online as free software at my site, nickm.com. The book is there as an example of how this particular material form can represent the code and the output, and how page differs from screen, sometimes in very interesting ways. If you’re lucky enough to be in Harvard Square often, please do come by to the reading. I will do my best to make it fun and provocative, and to provide some additional insight into computing and how it interacts with language. >My Winchester’s Nightmare: A Novel Machine (1999) was developed to bring the interactor’s input and the system’s output together into a texture like that of novelistic prose. Almost fifteen years later, after an electronic literature practice mainly related to poetry, I have developed two new “novel machines.” Rather than being works of interactive fiction, one (Nanowatt, 2013) is a collaborative demoscene production (specifically, a single-loading VIC-20 demo) and the other (World Clock, 2013) is a novel generator with accompanying printed book. These two productions offer an opportunity to discuss how my own and other highly computational electronic literature relates to the novel. Nanowatt and World Clock are non-interactive but use computation to manipulate language at low levels. I discuss these aspects and other recent electronic literature that engages the novel, considering to what extent novel-like computational literature in general is becoming less interactive and more fine-grained in its involvement with language. This was the topic of my talk at the recent ELO conference. Share and enjoy! I direct a lab at MIT called The Trope Tank. This is a lab for research, teaching, and creative production, located in building 14 (where the Hayden Library is also housed), in room 14N-233. Its mission is to develop new poetic practices and new understandings of digital media by focusing on the material, formal, and historical aspects of computation and language. The lab’s website has just been updated with some new information about our two major creative/research projects, Slant and Renderings. Earlier this academic year, a hardware and software catalog of Trope Tank resources was developed by Erik Stayton with contributions from Sylvia Tomayko-Peters. As usual, the Trope Tanks hosts the monthly meetings of the local interactive fiction club, the People’s Republic of Interactive Fiction. Also, the Trope Tank’s series of digital writing presentations, Purple Blurb, continued this year; I was on leave in Fall 2013, but the series was back and hosted four excellent presentations in Spring 2014. See those sites for more information about PR-IF and Purple Blurb. New Works: Creative projects released. Nanowatt, single-loading (3.5 KB) demoscene production for the VIC-20. By Nick Montfort, Michael C. Martin, and Patsy Baudoin as Nom de Nom, McMartin, and Baud 1. Shown and awarded 2nd place on 30 November 2013 at Récursion, Montréal. 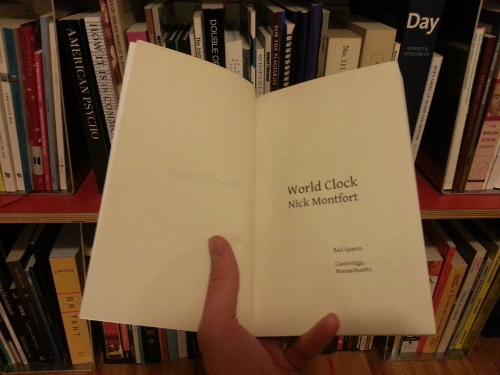 World Clock, computer generated novel with source code by Nick Montfort. Published on the Web 30 November 2013, in print at the Harvard Book Store. Round, digital poem by Nick Montfort. Published on the Web 14 August 2013 by New Binary Press. Duels — Duets, digital poem. By Stephanie Strickland and Nick Montfort. Published on the Web 14 August 2013 by New Binary Press. The Deletionist, digital poetry system. By Nick Montfort, Amaranth Borsuk, and Jesper Juul. 2011–2013. Premiered at E-Poetry 2013 in London and published on the Web. Three Rails Live, an interactive video installation. By Rod Coover, Nick Montfort and Scott Rettberg. 2011–2013. Documentation published on the web in bleuOrange 7, 2013. Trope Reports: We have issued two technical reports. Montfort, Nick “Exploratory Programming,” first of four major topics for the online Critical Code Studies Working Group 2014, 23 February-23 March, 2014. Montfort, Nick, “Aesthetic Obfuscated Code,” Symposium on Obfusctation, New York University, 15 February 2014. Montfort, Nick, “Ten Cases of Computational Poetics,” UCLA, M/ELT, 17 January 2014. Marecki, Piotr, “Polish Literature in the Digital Age,” IAP talk, MIT, January 21, 2014. Montfort, Nick, “Computational Literary Models for Fun and Poetics,” Concordia University, Montréal, 10 January 2014. Montfort, Nick, “Scaling Up Literary Models with Curveship and Slant,” 8th Mexican International Colloquium on Computational Creativity, UNAM, Mexico City, 15 November 2013. Montfort, Nick, “Literary Models,” 8th Mexican International Colloquium on Computational Creativity, UAM Cuajimalpa, Mexico City, 14 November 2013. Montfort, Nick, “Electronic Literature and Other Forms of Popular Creative Computing.” Keynote address at Writing Literature, Reading Society, Municipal Public Library, Kraków, 29 October 2013. Translations: Andrew Campana translated “The Two” by Nick Montfort into Japanese. Piotr Marecki translated Montfort’s “Lede,” “The Two,” and World Clock (via translation of the novel-generating program) into Polish, and, with Aleksandra Ma&lstrok;ecka, translated “Between Page and Screen” by Amaranth Borsuk and Brad Bouse into Polish. These will be placed online when revisions are complete. The Trope Tank hosted a visit by The Word Made Digital, 21W.764, during Spring 2014. “Exploratory Programming Workshop” by Nick Montfort, New York University, 14 February 2014. Commodore 64 BASIC Workshop by Nick Montfort, offered for MIT’s Independent Activities Period, 29 January 2014. “Workshop in Exploratory Programming” by Nick Montfort, UAM Cuajimalpa, Mexico City, two meetings on 11-12 November 2013. 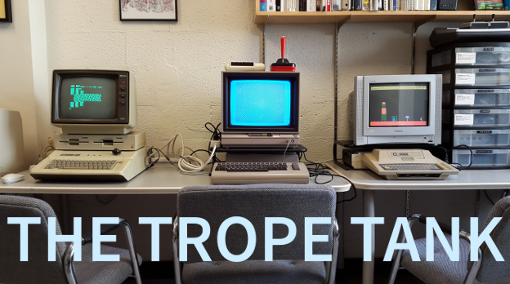 Upcoming: In Milwaukee this month Trope Tank researchers will present at (int)7 (Intelligent Narrative Technologies 7) and the Electronic Literature Organization Conference. The presentation will be “Expressing the Narrator’s Expectations” by Montfort and Stayton at (int)7, and at ELO in the conference paper sessions “The Formation of the Field of Electronic Literature in Poland” by Marecki, “Computational Editions, Ports, and Remakes of ‘First Screening’ and ‘Karateka'” by Stayton and Montfort, and “New Novel Machines: Nanowatt and World Clock” by Montfort. The ELO Media Arts show will include “The Postulate to Hyperdescribe the World” by Marecki and Aleksandra Ma&lstrok;ecka and “Round” by Montfort. Andrew Campana’s work will be part of the Gallery of E-Lit 1st Encounters. Many papers and even some books developed with Trope Tank support are forthcoming, but instead of trying to enumerate those, I’ll list them next year, when they have appeared. In that case it’s an unwitting answer. In any case, it’s a nice one.